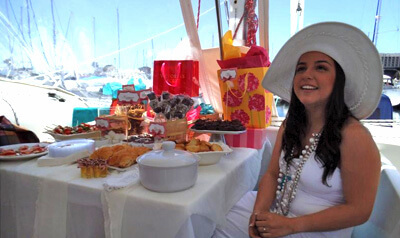 Why Plan A San Diego Bachelorette Party On A Boat? Planning a San Diego Bachelorette party? 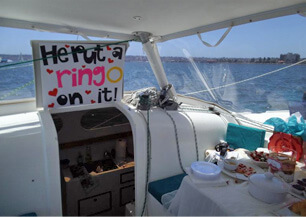 As one of the most popular choices for a San Diego sunset sail, we’re more than qualified to handle bachelorette parties as well. Sailing with Fun Cat has always centered around personal, memorable experiences. When we provide charter guests some of the best sailing tours San Diego, it’s more than just sitting on a boat off the coast. Between the shimmering waters, cool breeze, aquatic life, and the unbeatable feeling of wiping away your stress, choosing us for your bachelorette party is an obvious move. Our captain has more than two decades of chartering experience, and with the roomy Tigress catamaran, parties can easily fit up to a dozen guests. He’ll work closely with you to plan, design, and set-up the event so that you won’t have to worry about how to throw a bachelorette party on a boat. 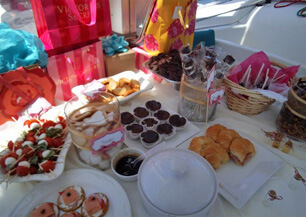 Fun Cat Sailing’s bachelorette cruise is a blast aboard our catamaran, the Tigress! It is the perfect boat to come aboard and enjoy one of your most special days. Formal or more casual, you choose. I will work closely with you to design the best bachelorette party San Diego has ever seen and create the memories of a lifetime. With your own music, special food, gifts, and your best friends and family with you, it will be your perfect day. Call me for details and pricing. Why Go On A Bachelorette Cruise In San Diego? While it’s probably not too difficult to think of bachelorette party ideas in San Diego, there are still other factors that might otherwise lessen your overall experience. It’s a crowded city meaning venue availability could be spotty, and its proximity to the ocean makes it a summertime hotspot for tourists, vacationers, and natives. If you’re looking for something more personal, intimate, and meaningful, then a catamaran boat is the way to go. As one of the leading San Diego bachelorette party experiences, you’ll be experiencing all the best parts of the city, while relaxing under the sunshine next to your closest friends and family. If it’s adventure that you’re looking for, we even encourage you and your party to make a splash by jumping off the catamaran for a dip! And you’ll have total control over the theme, music, food, decorations, plans, and whether it’s formal or casual. Our mission is simply to give you an experience that you won’t forget. Captain Rod knows what he is doing! It rained the day before we set sail and I was sure we would have to cancel. Rod assured me that it would not rain and instead suggested it would be the perfect day to take my good friends and bride-to-be out on the bay. I was skeptical, but the man knows what he is talking about! Not only did it not rain, it was gorgeous! Rod stayed in communication with me the whole time before we arrived. He let me know what to expect, what to bring and what to leave at home. The Tigress was clean and Rod was easy going and assuring. As if captain Rod parting the skies for my best friend’s special day wasn’t enough, he pretty much let us take over the boat like pirates. We had loud music playing, champagne, cupcakes, and silliness flooding the boat, as Rod just looked off into the distance with one watchful eye on his guests. We went under the Coronado Bridges, and over into the Coronado Harbor for some really great photos that will keep this group of girls bonded for years to come. Rod was really a great tour guide and an even better sport at letting this bachelorette party in San Diego take over his boat for a few hours. I plan on doing this again just for fun. If you grab a handful of friends it’s a true bargain. The price is well worth the unique experience you will have in one of the most beautiful cities to set sail.